This entry was posted in Ecuador and tagged Cantos y Cuentos de los Derechos de la Naturaleza, Cuenca, Ecuador, La Casa de la Cultura, Nelson Denman. Bookmark the permalink. NEWS ITEM: A Donor will match all grants until we reach our combined goal of $30,000. Please donate what you can today! Beautiful show, Nelson! Your versatile music with Consuelo and Lisa was marvelous. A beautiful evening at the Loretto Chapel last night with cellist Nelson Denman, songbird Consuelo Luz and guitarist Joaquin Gallegos. Dear Nelson, I think you have written this beautifully and presented the goal well. I only hope people can slow down from their busy lives to pay attention to the rapidity of the global disintegration and realize that making money is a fool’s game. Creation, preservation, conservation, and replanting and replacing all that has been lost is our only hope to survive as a species. Bonne chance! Nels-thank you for a gorgeous afternoon with you, Beethoven and the Kamuela Philharmonic orchestra! 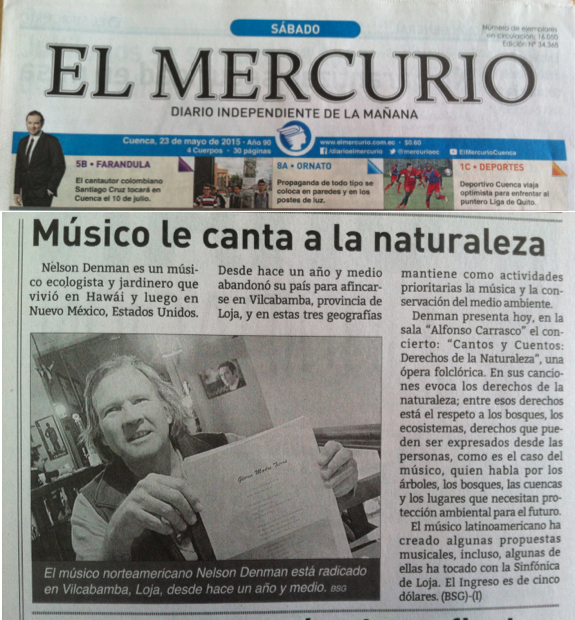 Nelson’s music opens doors of consciousness, singing the oneness of the Earth and her wonders. His voice spans borders and human differences. Using humor, vitality, good information, true spirit and his gifted hands.